Traditionally, most high rises have been uniform buildings rising out of the ground more or less straight up into the air. In recent times we’ve seen many innovations with angled, sloping or cascading tiered structures emerge. Though in the main, the landscape for tall buildings has been one of conformity as much for economic and efficient construction considerations. 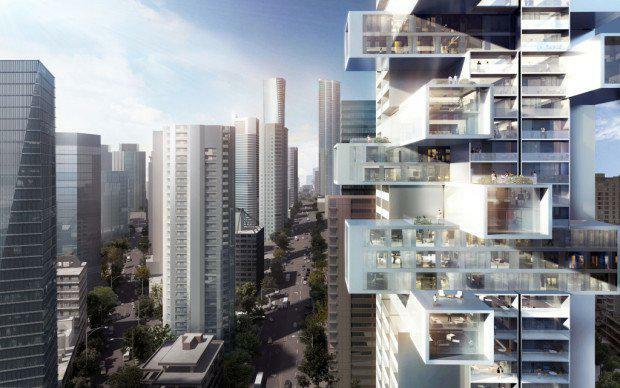 However, architect Ole Scheeren (Buro Ole Scheeren, Hong Kong/Beijing) is proposing a radical overhaul with his 1500 West Georgia residential project in Vancouver, Canada. The building described by Wired magazine’s Liz Stinson looks as though “a handful of shipping containers has been inserted into an otherwise normal, glassy tower,” or in another way, as though a bunch of Jenga blocks have been randomly removed and stuck back in at right angles. He views high rises as having become boring and being removed from their landscape. His design is an effort for residents to connect with the outside world through a different thinking in structure design. Most of the building will be made out of concrete with the cantilevers jutting into the open air being constructed of steel. By opening up the structure in this way to project the space of living outwards into the site’s surroundings he also will minimise the building’s footprint, which will be surrounded by an open public plaza. ALSO SEE: Is This The World’s Most Minimalist House Ever Designed? As you’d expect of such a forward thinking structure of this type, sustainability strategies are implemented to ensure energy savings along with integration of renewable energy sources. 1500 West Georgia was commissioned in February 2015 and will comprise 235 units plus retail and car parking.